Ian Middleton (left), the Managing Director of DT Dobie, Edward Githinji (Second left), Sales Executive, Gerald Trempont (right), CFAO Brand Manager and Lawrence Kiambati (second right), Senior Sales Executive unveil the new Mercedes Benz C Class luxury saloon for the Kenya market. 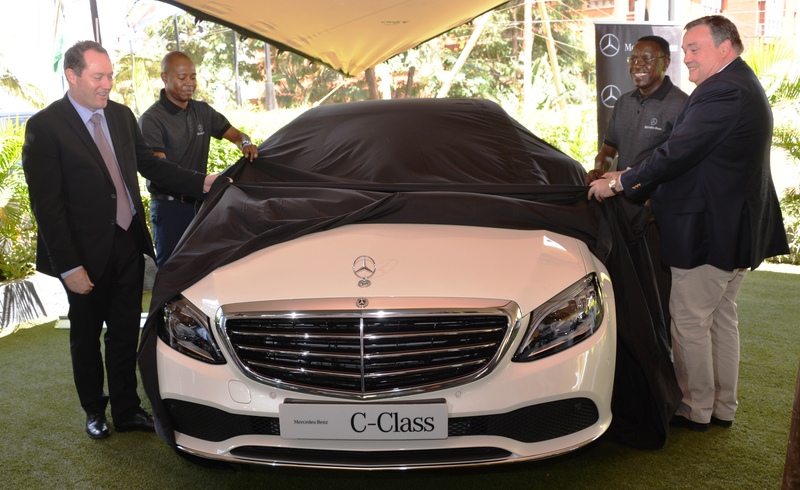 Ian Middleton, the Managing Director of DT Dobie and Maliha Sheikh, the General Manager for Mercedes unveiled the new four door Mercedes C-Class luxury saloon for the Kenya market. Before lifting the cover from the new model they described the pace setting specifications of the car. Owners will also have an optional fully digital instrument display and multimedia systems with tailor made information and music. A customer ordering a new C-Class has a wide choice of options including a driver assistance package featuring park distance control, steering assist and support for the driver to keep a safe distance from other vehicles on some models. Speed is now adjusted automatically ahead of bends, junctions and traffic islands. A fully digital instrument display is available as an option which comprises a 24 centimetre high resolution cluster with cutting edge screen design. Buyers can also choose an energizing convenience adjustment which systematically uses the functions of climate control, seats with heater, ventilation and massage capability and lighting and musical moods. As with the S-Class there is availability of multicontour seat package which gives individual adjustment by an electrically driven pneumatic pump for the side bolsters and massage in the lumber area. The class leading equipment and technology of the C-Class are the result of work of the Mercedes designers and the use of motor racing as a means of developing and testing new technology. The Formula One racing cars which have been driven so successfully by World Champion Lewis Hamilton and Valtteri Bottas will help to provide advanced performance and safety features for future passenger cars.